Вартість: 14278 грн. + 979 грн. (доставка) + розтаможка 5639 грн. Processor Type: Intel Core i3 8th Gen. 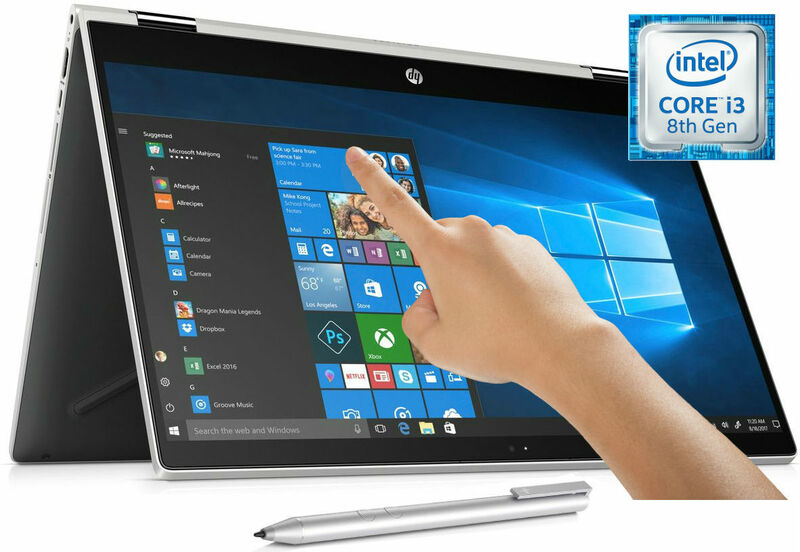 Processor: Intel Core i3 8th Gen.
HP Pavilion x360 2-in-1 Convertible Full-HD TouchScreen Sleek Laptop - 8th Gen. Intel Core i3-8130U 2.20GHz - 3.40GHz Turbo Processor w/4MB Cache - 20GB Total Memory (4GB Ram + Intel 16GB Optane Flash Memory) - 1TB Hard Drive - 15.6" LED-backlit TouchScreen 1920 x 1080 Full-HD IPS Edge-to-Edge Glass Display - HD Webcam - Multi Card Reader - Wireless AC - Bluetooth 4.2 - USB 3.1 - HDMI - Intel UHD 620 Graphics - 360 Degree Hinge - Backlit Keyboard - B&O Play w/Dual Speakers ~ Sealed Box! Built with a 360° design, the 15.6" Pavilion x360 Multi-Touch 2-in-1 Notebook from HP is optimized for inking. Its responsive design adapts to how you move, helping to enhance creativity and simply demanding tasks. It also lets users remain secure and productive, with features like Windows Hello and Cortana. The system is powered by a 2.20GHz 8th Gen. Intel Core i3-8130U Quad-Core processor, which allows you to run multiple applications simultaneously. If you need more power, the system can be overclocked to 3.40GHz. The system has a total o 20GB Memory, 4GB of 2400 MHz DDR4 RAM + the New Intel Optane 16GB flash memory helps to ensure smooth multitasking and also allows the computer to quickly access frequently used files and programs. The 15.6" IPS BrightView micro-edgedisplay features a Full HD 1920 x 1080 native resolution, viewing angles of 178°, WLED-backlighting, and a 16:9 aspect ratio. The display also features edge-to-edge multi-touch functionality, allowing you to utilize the touch gestures and functions in Windows 10 to further improve accessibility and productivity. The integrated Intel UHD 620 Graphics chipset delivers a sharp, clear picture and you'll be able to output video to two external 4K displays using the system's HDMI port and DisplayPort 1.4 via USB Type-C.
For storage of your files, the Pavilion x360 is equipped with a 1TB 7200 rpm SATA 2.5" hard drive. If you want to add external storage, optical drives, memory card readers, and more, there is one USB 3.1 Gen 1 Type-C port, which supports HP Sleep & Charge, plus two USB 3.1 Gen 1 Type-A ports, one of which supports Sleep & Charge. Wi-Fi (802.11ac) is built-in for wireless networking and Bluetooth 4.2 technology will also allow you to connect additional compatible wireless peripherals. A built-in multi-format SD card reader lets users download content from their digital camera and other integrated features include an HP TrueVision Full HD IR webcam, dual-array digital microphones, and stereo speakers tuned by Bang & Olufsen. HP's 15.6" Pavilion x360 Multi-Touch Notebook includes a 45W AC adapter, and its 3-cell / 48Wh lithium-ion battery can last up to 10.5 hours before recharging is required, and can be recharged to 50% in around 45 minutes with HP Fast Charge. The installed operating system is Windows 10 Home (64-bit). The 360° hinge allows the HP Pavilion x360 to be used in four versatile modes. Use stand mode to watch movies and video conference; tablet mode to surf the web and read; notebook mode to work; and tent mode to give presentations and share photos. The 15.6" edge-to-edge IPS Multi-Touch touchscreen display of the HP Pavilion x360 features WLED backlighting, a 16:9 aspect ratio, and a 1920 x 1080 screen resolution, which can play Full HD content natively without upscaling. You can also output video to an external display via the HDMI port, or take advantage of DisplayPort 1.2 via USB Type-C. The 1920 x 1080 resolution boasts impressive color and clarity. Touch, tap, glide and make the most of Windows 10. IPS technology for wide viewing angles. Energy-efficient WLED backlight. Ultra-low-voltage platform. Dual-core processing provides maximum high-efficiency power to go. Intel Turbo Boost Technology delivers dynamic extra power when you need it. Holds a sizeable collection of digital photos, music, HD videos and DVD-quality movies. 7200 rpm spindle speed enables rapid read/write times for handling large files and complex applications. Thin and light design with DVD/CD drive omitted for improved portability. 3-cell lithium-ion battery. Grade A+ Factory Refurbished Like New in Sealed Box! - 90-Day Warranty! - Fast Free Shipping! - 100% Positive Feedback! This Laptop is Factory Refurbished to Brand New condition and is covered by a 90-Day Limited Hardware Warranty for US Purchases. For Warranty Claims, please contact our customer service team. For a full written disclosure of HP 's warranty on this product or any other questions regarding their warranty. Change of Address: When check out, please ensure your ship to address in accurate. Change of address requests after payment has been made may result in delays. Addresses outside lower 48 states: Please note that the Free FedEx Ground/Home Delivery option is only applicable to physical addresses within the continental United States (lower 48 states). For all US shipping addresses that include a P.O. Box or are outside of the lower 48 states (i.e. Alaska, Hawaii, Puerto Rico, Guam, and other US territories), please choose USPS Priority Mail as the shipping option. Tracking: Tracking information is automatically emailed within 1 business day after receiving a cleared payment. If you do not receive your tracking information, please check your spam folder. Do not hesitate to send us an email if you need us to provide this information again. We want to make sure you are completely satisfied with your purchase. Notes to International Customers: There may be additional customs, duties, and taxes fees assessed when picking up your item. Those fees are solely the buyer’s responsibility. Please contact your local customs agency for more information. Auctioneers Deals diligently strives to provide you outstanding electronic products at discounted prices with fantastic customer service. As you can see with our feedback, we aim to provide all of our customers with a fantastic buying experience. If you have any questions or need any information, feel free to email us through Ebay. We want to make sure you are very satisfied with your purchase. If you are experiencing a problem with your product, please contact us so that we can help. We do accept US returns within 14-days of receiving the product and with a RMA (Return Merchandise Authorization). The product should be in the condition in which it was purchased or there may be a restocking fee assessed. If considering a return, please contact us for more information and to receive a RMA.